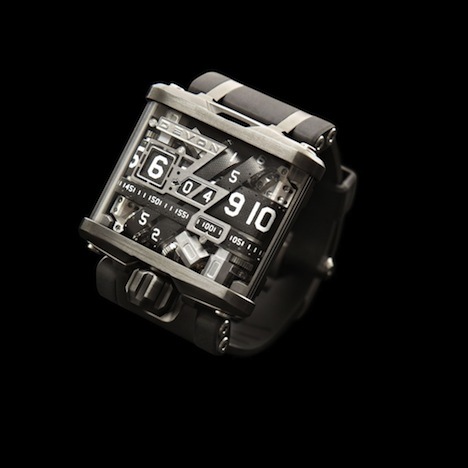 The Devon Tread Watch Costs More Than A Reasonably Priced Car | OhGizmo! Geeky timepieces with obtuse time telling schemes, the likes Tokyoflash specialize in, are not the only kind we talk about at OhGizmo. We also enjoy a fine piece of engineering, one where aesthetics collides with astronomical prices to create a piece worth talking about, if not necessarily lusting after. The Devon Tread is just such a watch. The exposed movement is a mesmerizing display of the patented interwoven system of conveyor belts. This series of belts includes critical elements that allow the optical recognition system to know every belt position at all times. The Tread 1 Watch features four internal 2-micron thin belts that spin within the case to display the time. It’s powered by a lithium polymer rechargeable cell that is charged by wireless induction. This electric system runs the belts that are kept in tune with an optical technology. Add that all up, and you have one of the most technically advanced, visually stunning watches ever made. Yeah, it’s pretty impressive. You can tell there’s a lot going on inside that watch, as you can see in the below video. But is it worth $17,500? Really?